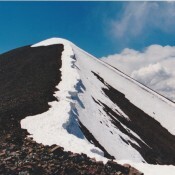 Climbing information for this peak is found on pages 262 and 263. 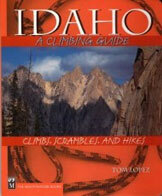 Three routes are included in the book. 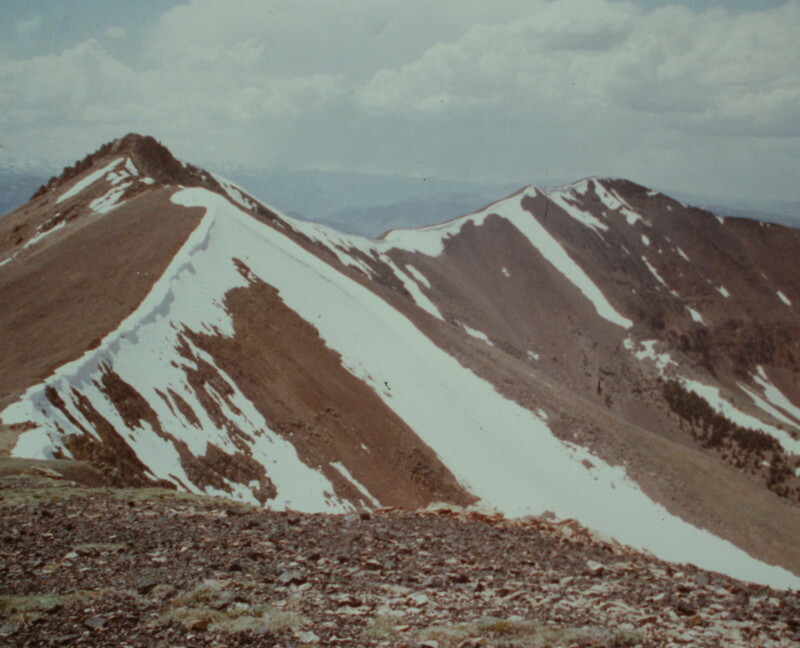 Livingston Douglas made the first recorded ascent of the peak’s Southwest Ridge. His route is included below. 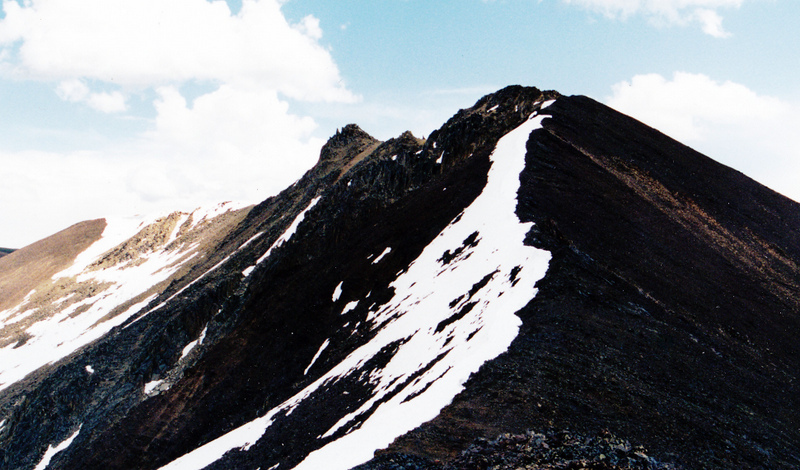 Cabin Mountain has two summits with over 300 feet of prominence. 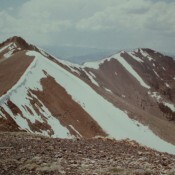 The northernmost, North Cabin Mountain, is not individually identified in the book. 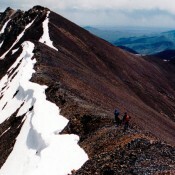 The easiest way to collect both summits is to climb from the Corral Creek Road on the west side of the range. Hike up the drainage until you can access the northwest ridge. Follow the ridge to the top of North Cabin and then ascend the connecting ridge to the top. Class 3. 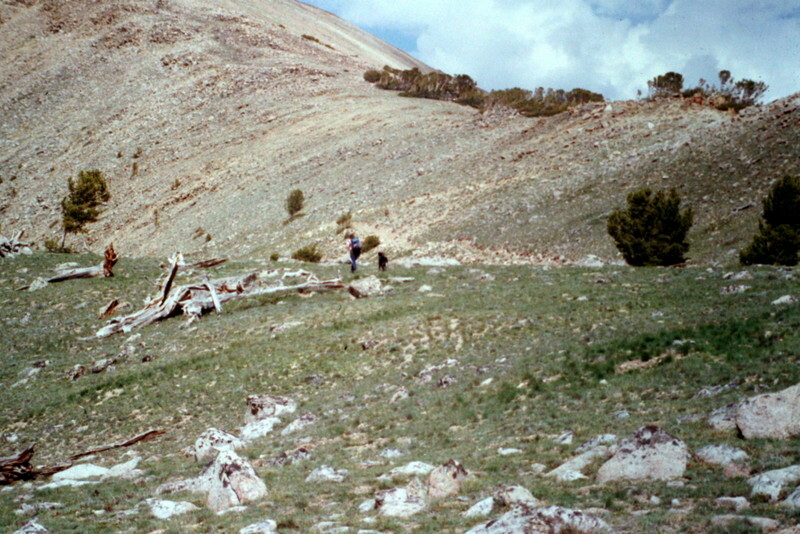 The shortest approach to Cabin Mountain is from the west. 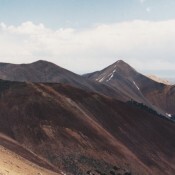 However, the peak is often climbed from the east in a long day along while also climbing Lime Mountain, Shelly Mountain, and Redbird Mountain. Use the link below to read John Platt’s trip report if you want to do all the peaks in one day. 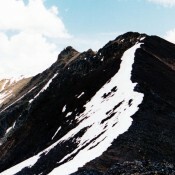 The east ridge of Cabin Mountain. Hiking between Lime and Cabin Mountain. 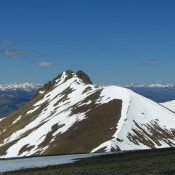 The summit of Cabin Mountain from North Cabin Mountain. Cabin Mountain from Lime Mountain. Redbird and Shelly Mountains from Lime Mountain. 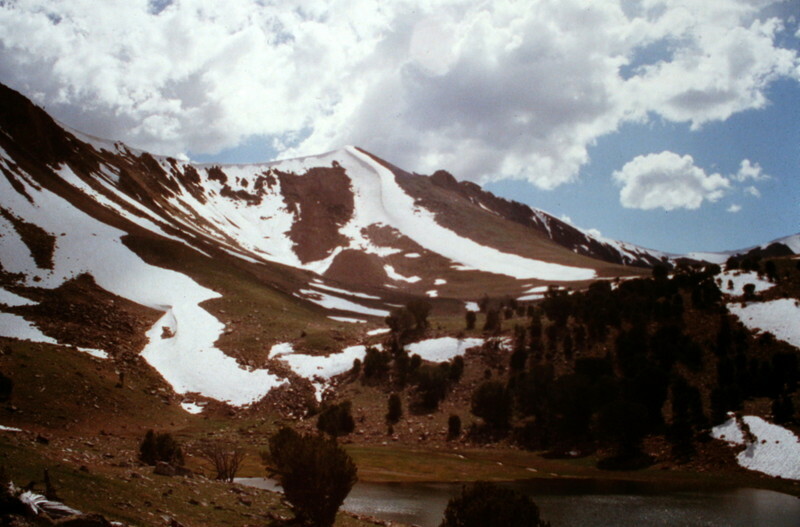 The upper end of Corral Creek is covered by high altitude meadows making it the route of choice for Cabin Peak. 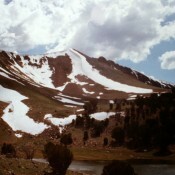 One more view of the top of the Corral Creek drainage. I climbed this route on 7/5/16. From its junction with Forest Service Road (FSR)-138/Copper Basin Loop Road, drive east, then north, on FSR-142/Burma Road for 0.4 mile. You will cross both the East Fork Big Lost River and Cabin Creek en route. Continue to a junction with an unmarked 2-track jeep road that follows the north side of Cabin Creek. Pull off the road and park at this junction (7,740 feet). Hike up the 2-track jeep road, which is overgrown with field grass. Cross Cabin Creek three times and go through three cattle gates/crossings. Thankfully, Cabin Creek is rather small and easy to cross in summer. At the third and final cattle gate/crossing, the road ends and a good cattle trail begins. This cattle trail will make your hike immeasurably easier in your ascent of Cabin Creek drainage. Your size 11s might not appreciate the narrowness of the cattle trail, but you will make fast progress up the angled sagebrush slope on either side of Cabin Creek. The 2-track road ends and the cattle trail begins on the south side of Cabin Creek. 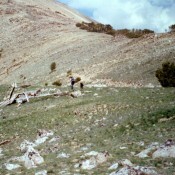 The cattle trail crosses to the north side of Cabin Creek at about 8,000 feet. From here, the trail follows the north side of Cabin Creek up the drainage to about 0.5 mile past Redbird Gulch. The trail reaches Redbird Gulch (which empties into Cabin Creek from your left) at about 3 miles from the road junction where you began the hike. Redbird Gulch is a thicket of tall willows that will scare you. But, fear not, the cattle have taken care of this problem. The cattle trail adroitly angles into the gulch, crosses the stream, and angles back up out of the gulch on the other side. You are now at the base of the southwest ridge of Cabin Mountain and your climb begins. 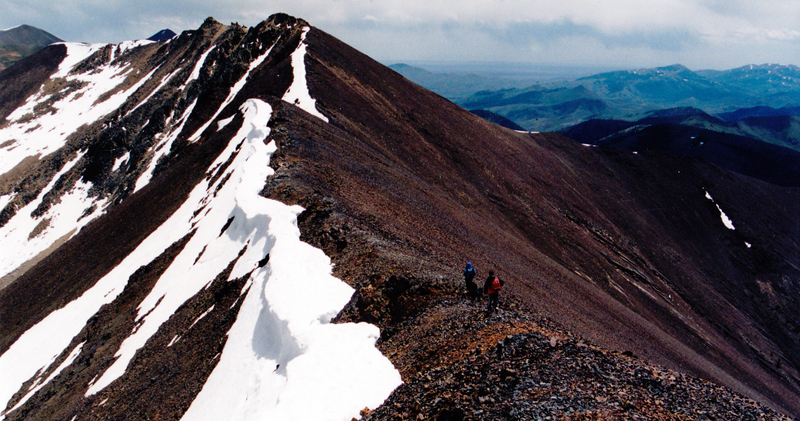 Climb northeast up the steep sagebrush slope on the rounded, rather ill-defined ridge. You’ll eventually reach open forest and keep climbing upward. This climb will feel more like a face climb now, as the ridge is particularly ill-defined. Just keep grinding in a northeasterly direction. You will ascend elevation quickly because the climbing is easy, assuming that you’ve been doing your intense cardiovascular training before attempting this climb. When you reach treeline at 9,800 feet, you still can’t see the summit. Above treeline, the terrain becomes broken shale that is somewhat loose, but not too bad. 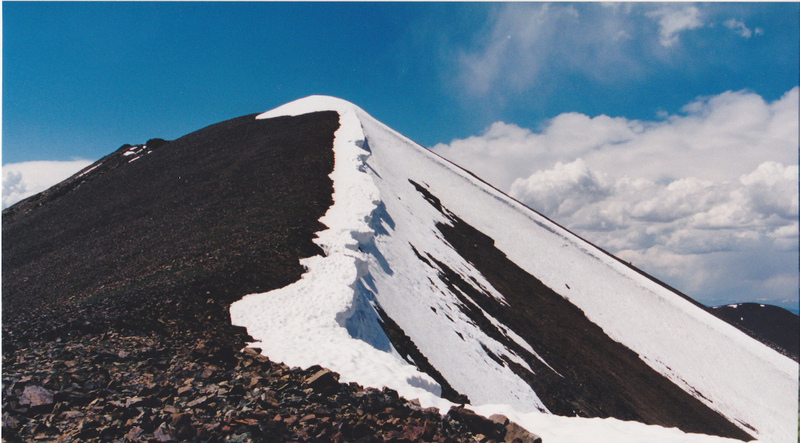 At approximately 10,400 feet, you will reach a merge with the [better-defined] south ridge. Make a mental note of this juncture so you follow the correct ridge on your descent. Now the southwest ridge is well-defined and there are no knife-edges or rocky outcrops. Just keep grinding your way northeast up the shale and you’ll eventually reach the class 2+ summit rocks of Cabin Mountain. The views from the summit are beautiful. 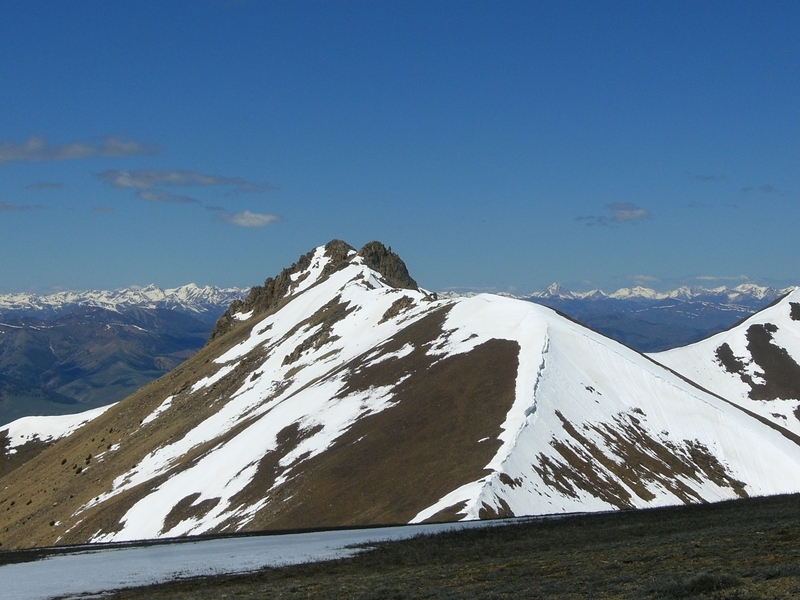 You are now on the White Knob Divide and, if you’re a peakbagger, you are in position to whack a total of five of Idaho’s 11ers today (North Cabin Mountain, Cabin Mountain, Lime Mountain, Redbird Mountain, and Shelly Mountain). 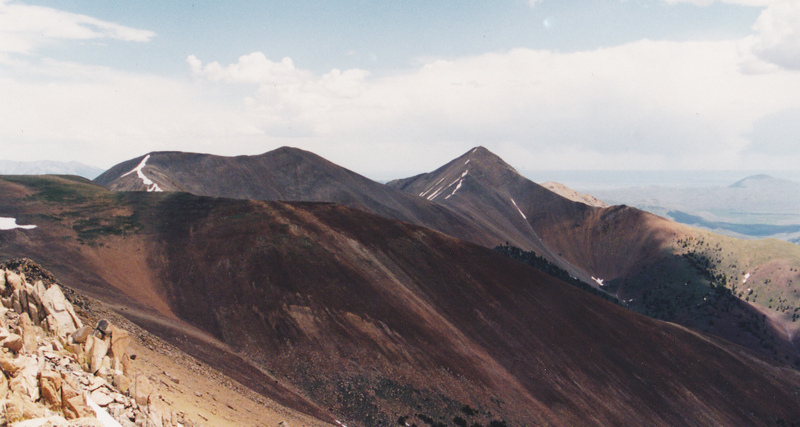 If you decide to do the ridge traverse southeast to Shelly Mountain, you can descend to the Cabin Creek drainage via Shelly Mountain’s Southwest Ridge Route.